The San Jose Sharks topped the Columbus Blue Jackets in a shootout to earn their 4th straight win. That’s the story line that you’re likely to see after the game last night (March 13) but it really misses a bigger point. Sure, the Sharks are having an amazing season. They’re favored by many, including yours truly, to win the Stanley Cup this season. They’ve been building a contender for several seasons and they finally have the pieces to challenge for the greatest trophy in sports. The point that some are missing is how well the Blue Jackets played in this game, and how badly the shootout needs to go. First we’ll tackle the shootout. Yesterday’s game was so exciting that casual hockey fans were freaking out. The Blue Jackets took the lead twice, going up 1-0 and then 2-1 before they had to battle back to make it a tie game at 3-3 late in the third period. Twitter blew up with excited spectators who were tuning into the game, and for once they weren’t just Blue Jackets fans. The best part was that the Blue Jackets were dominating the possession play and creating several quality scoring chances up until the very end of overtime. Then overtime stopped and the excitement died. I’d watch another five minute OT between these two teams. Even though the Jackets were outplaying the Sharks and had the best chance to win the game in a 4 on 4 setting, it ended in a skills competition, based on the skill set of one single player rather than the play of a team. The strategy of the game is removed in the shootout. Positional play no longer matters, giveaways and takeaways no longer matter, and most importantly, a very exciting game was ruined by a shootout. Even as a Blue Jackets fan, I know that one unlucky bounce could’ve set up the Sharks on a game-winning breakaway, even though the Jackets were playing better than the Sharks. However, it would be much more rewarding to see a game end on that note than the way that it actually ended. The shootout is nothing more than a novelty. To reiterate a point, the NBA doesn’t play a game of H-O-R-S-E after one frame of overtime, and the MLB doesn’t switch to a homerun derby after the 10th inning. That’s how ridiculous the shootout really is. Next we can talk about how well the Blue Jackets played against such an elite team. 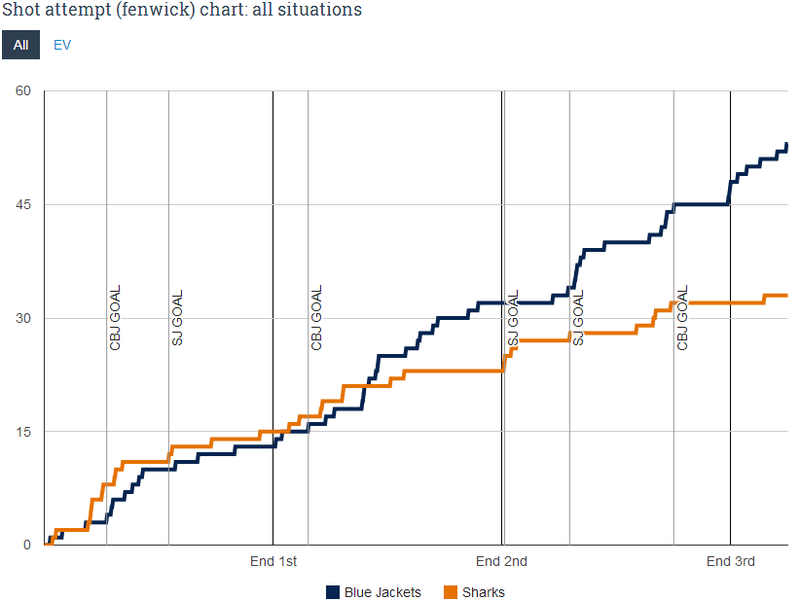 The Jackets had more shot attempts than the Sharks by a large margin. The final tally according to Extra Skater indicated that the Jackets had 71 shot attempts and the Sharks only had 45 attempts. Corsi doesn’t always indicate who the winner of a hockey game is, but it usually indicates who controlled play and that usually indicates who has the best chances of winning, especially when their is such a large margin between the two teams. Typically, the Sharks control the possession throughout most of their games played, but the Blue Jackets took them to puck possession school last night. There was a time when coaches would roll out a checking line to generate energy and emotion within their team during key points of a game. This is something that the Blue Jackets are doing, and they’re doing it well. When healthy, this line consists of Blake Comeau, Mark Letestu and Derek MacKenzie. Collectively they’ve put up 54 points this season through 66 games, with 31 man-games lost to injury between them, they’re almost averaging a point per game. Their ability to roll all 4 lines throughout each game is practically unparalleled. Every 4th liner is averaging 11+ minutes of ice time per night. This all speaks volumes to how deep this team truly is. The Jackets have been playing very well over the past few months. They currently hold the second spot in the Metropolitan Division (with the one point gained last night) and are 5-1-1 in the month of March. If they can maintain their possession into the playoffs and, lord willing, their health, they’ll be a very scary team for their first round opponents.